Feints, counters, infighting, low blows, showboating—and that's just what it took to get Floyd Mayweather Jr. and Manny Pacquiao into the same ring. An exclusive, behind-the-scenes look reveals the the six-years' war that went into negotiating boxing's richest bout. This story appears in the May 4, 2015, issue of Sports Illustrated. Subscribe to the magazine here. On a shopworn white legal pad, buried in a file in the desk of a network executive turned freelance producer, is a piece of boxing history. On May 1, 2010, Ross Greenburg, then president of HBO Sports, stood at the intersection of boxing's two most powerful fighters: Floyd Mayweather Jr. and Manny Pacquiao, welterweight kingpins and Nos. 1 and 2, respectively, on everyone's pound-for-pound list. That night, hours after Mayweather's defeat of Shane Mosley, Greenburg made a decision: He was going to give negotiations for a Mayweather-Pacquiao fight another shot. Six months earlier Greenburg had been little more than a horrified bystander as promising talks between the two camps ground to a halt: open, friendly dialogue devolving into a nasty war of words. Still, the crumbling of the negotiations had only made the public's appetite for a showdown stronger. "We were going to be talking about this fight every six months," says Greenburg. "We had to give it another try." 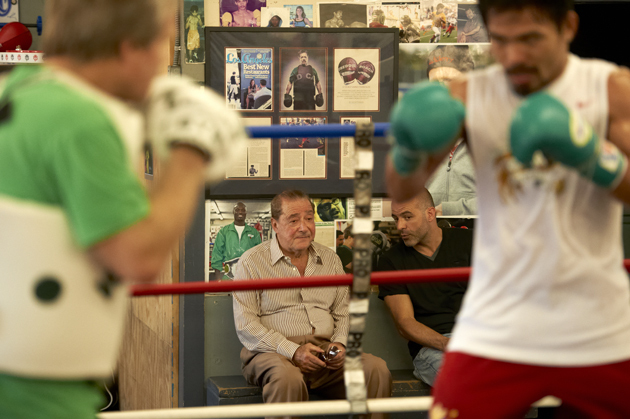 The next week Greenburg called Bob Arum, the CEO of Top Rank Boxing and Pacquiao's promoter. For several hours Greenburg outlined Pacquiao's side of a contract, scribbling down deal points over several pages of his notepad. Days later, outside the HBO offices in Santa Monica, Calif., Greenburg, cellphone pressed to his ear, notepad in hand, went over the deal with Al Haymon, the longtime music promoter turned boxing power broker who is Mayweather's adviser. Their talks were among the first of dozens of calls Greenburg made to Arum and Haymon in a desperate attempt to end a deeply rooted conflict. Five years later Greenburg has moved on. He left HBO in 2011; his connection to the fight now is through the Mayweather documentaries for which Showtime hired him to be an executive producer. For Greenburg, the notepad is evidence of the uncounted hours he spent helping to broker a peace that eventually yielded a bout worth hundreds of millions of dollars. "If they ever made the fight," says Greenburg, "it would be something worth having." The first fight was our fault. We just should have said, 'F--- it,' and done the testing. It was 100% our fault. In the fall of 2009, interest in Mayweather-Pacquiao reached a new high. Mayweather scored a lopsided decision over Juan Manuel Marquez, his first fight after a 21-month retirement; eight weeks later Pacquiao blitzed Miguel Cotto, stopping the former champ in the 12th round. With few other viable opponents—and with HBO, the network behind both fighters, pushing—representatives of Golden Boy Promotions, which at the time handled Mayweather, and Top Rank began formal discussions. Mayweather had history with Top Rank, which had signed him after he claimed a bronze medal at the 1996 Olympics. Over the next decade Arum & Co. built a talented prospect into a bankable pay-per-view star. Then, in 2006, Mayweather, with the help of Haymon, exercised a buyout in his contract. Top Rank received $750,000; two bouts later Mayweather decisioned Oscar De La Hoya in a fight that generated a then record $136 million. Arum blamed Mayweather for freezing him out of the De La Hoya fight. He blamed Haymon, the most influential voice in Mayweather's camp, more. "Arum thinks Haymon is disruptive and destroying the boxing model," says Greenburg. "And Haymon, he thinks Arum is disruptive and destroying the boxing model. You can't measure the animosity between those two." Yet, surprisingly, early talks went well. The sides quickly agreed on a 50-50 split. Minor (read: ego) issues were ironed out too: Pacquiao would walk out first; Mayweather would be introduced first. Mayweather would get his choice of corner; Pacquiao would get dibs on a locker room. When Greenburg, who had built a relationship with Cowboys owner Jerry Jones during filming of Hard Knocks, brought up Jones's offer to stage the fight at then Cowboys Stadium in Arlington, Texas, Arum was open to it. When Mayweather wasn't, Arum signed on to hold the fight in Las Vegas. It was almost too easy. "It took like 10 days," says Todd duBoef, Arum's stepson and the president of Top Rank. "All terms were agreed to." It was clear that both boxers wanted the fight too. Stephen Espinoza, then a lawyer for Golden Boy and now the executive vice president of Showtime Sports, recalls a call from a Top Rank lawyer a few days before Christmas. One more thing, the lawyer said. 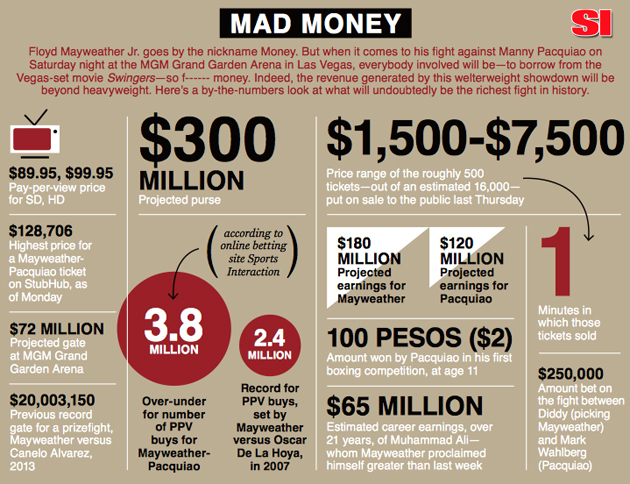 Manny would like a weight penalty: $10 million for every pound over the 147-pound limit. "To me," says Espinoza, "it was an ask designed to blow up the fight." He relayed the request to then Golden Boy CEO Richard Schaefer, fully expecting it to be rejected. Fifteen minutes later Schaefer called back with a yes. Drug testing, however, was a real obstacle. According to DuBoef, random blood and urine testing hadn't been part of negotiations. "It just showed up in a contract," he says. Mayweather's side tells a different story: Blood testing was in the original draft; Top Rank just kept deleting it, and when presented to Pacquiao, it was rejected, on account of the fighter's fear of needles. "That was funny," says Leonard Ellerbe, CEO of Mayweather Promotions, "because he has tattoos." Eventually Pacquiao agreed to testing—within limits. Because, his camp noted, Pacquiao had suffered an adverse reaction to blood testing two days before a 2005 loss to Erik Morales, he would not agree to being tested within 30 days of the fight. "With Manny it was mental," says Roach, Pacquiao's trainer. Working with Golden Boy executive Bruce Binkow, DuBoef looked for a solution. He researched the rules of the U.S. Anti-Doping Agency (USADA), which would have been contracted to do the testing. He engaged the CEO of USADA, Travis Tygart, on the effectiveness of testing with cutoff dates. Roach, along with Pacquiao's strength coach, Alex Ariza, conducted conference calls with Tygart too. Each counterproposal Top Rank made to Mayweather was rejected. "There has to be no notice," says Tygart. "It has to be unpredictable." Negotiations deteriorated in a matter of days. Arum called Mayweather's testing demand "a sham." Ellerbe countered with, "If you have nothing to hide, why not comply?" On Dec. 30, 2009, Pacquiao filed a defamation suit against Mayweather; Mayweather's father, Floyd Sr.; and Golden Boy among others. (The suit was settled in '12, under terms that remain confidential.) The sides agreed to mediation with Daniel Weinstein, a retired judge who had settled disputes between Top Rank and Golden Boy before. According to multiple sources, who would not comment publicly, citing confidentiality, the process wasn't productive. Says one source, "[Weinstein] would go to one room with a proposal, and it was, F--- you. He would go to the other, and it was, F--- you." On Jan. 6, 2010, Arum announced the fight was dead. Pacquiao would face Joshua Clottey in March. In May, Mayweather took on Mosley. We were so close. We were on the five-yard line. We just had to get beyond the drug testing. In the spring of 2010, HBO was the only thread connecting Mayweather and Pacquiao. Both fought under the network's banner; neither seemed inclined to fight the other. If a deal was going to be made, Greenburg reasoned, he was going to have to be in the middle. He called Arum. Let me try to put this together, he said. For years Arum had accused Greenburg of colluding with Haymon to get Mayweather out of his Top Rank contract. "Ross, I couldn't rely on him for anything," says Arum. "But I thought, Whatever, let him take a shot." In his office, Greenburg outlined the deal. Financial terms were the same. The Texas stadium was listed as a possible venue—if Mayweather was open to it. According to Arum and Greenburg, Pacquiao eventually acceded to full blood and urine testing all the way through the fight. "It was no longer an issue," says Greenburg. 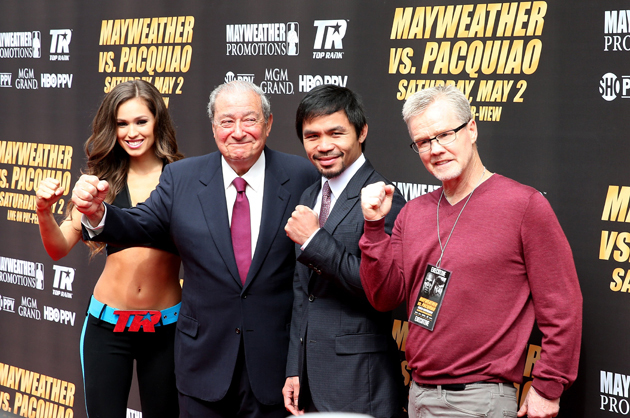 "Arum and Pacquiao took it off the table." Haymon was next. "I thought that talk went well," says Greenburg. Within weeks, he was brimming with optimism. In June, at an event at the Friars Club in New York City, Greenburg approached Arum and DuBoef. Recalls DuBoef, "He said, 'I think we are going to get this done.'" On June 30, Arum announced that terms had been reached; Mayweather had only to formally agree to them. Two weeks later Arum set a July 16 deadline for Mayweather to accept. Mayweather didn't, and Arum declared that Pacquiao was, once again, moving on. "We agreed to everything they wanted with the drug testing," says Arum, "and we heard nothing." Days later they heard something. In a series of public statements Mayweather's representatives—Ellerbe and Schaefer—not only declared that no deal had been reached, but they were also adamant that no negotiations had even taken place. In a statement Greenburg countered by confirming the negotiations. Mayweather's side continued to deny them. Arum called the situation "Kafkaesque." Greenburg says he never got a clear explanation from Haymon—who does not speak to the media—on why the deal fell apart. "Maybe he couldn't sell Floyd on the piece of paper," says Greenburg. Arum has a different theory: "Haymon was getting [HBO] dates [for his other fighters] during this. Negotiating the fight kept those coming." Greenburg calls Arum's interpretation "ridiculous." Hope for the fight faded. In 2011, Arum moved Pacquiao to Showtime. In '12, Mayweather made Pacquiao, who was back with HBO, an offer of $40 million to fight, which he rejected. In '13, Mayweather signed a six-bout deal with Showtime, seemingly ending any possibility of the fight.Asked if he had any regrets, Greenburg says, "I could never get Bob and Al in the same room." They didn't just end up at the game together. Floyd wanted to confront him. 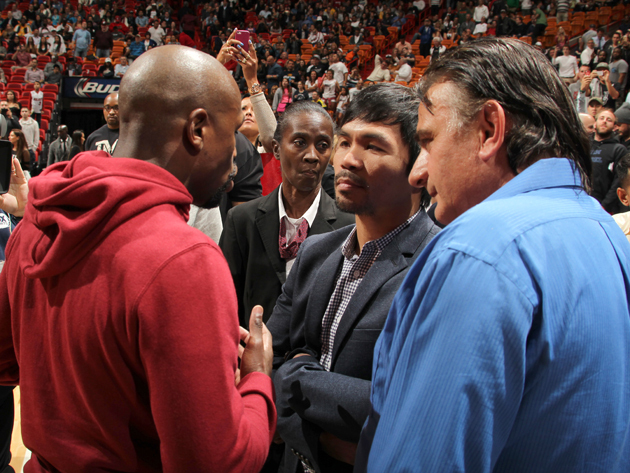 The boxers first met in person on Jan. 27 of this year, at AmericanAirlines Arena in Miami during a Bucks-Heat game. In the months since, this has been billed as a chance encounter, dumb luck that led to the richest fight in history. But that's not true, according to the Mayweather camp. Mayweather had been in Los Angeles the day before. 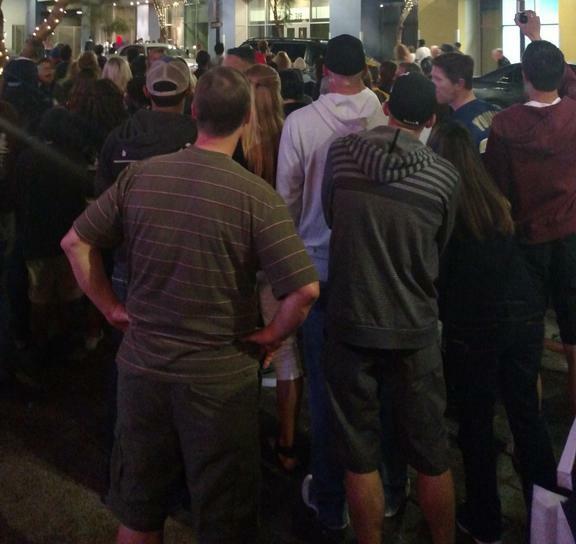 He told his entourage to drive back to Las Vegas, and the group arrived there around midnight. They were surprised, then, to be summoned early the next morning. Pack a bag, Mayweather instructed. We're heading to Miami. He didn't tell them why at first, but as his private jet landed that afternoon, he made an announcement: We're going to the Heat game. They settled into seats next to the Miami bench and there, across the court, sat Pacquiao, who was in town as a Miss Universe judge. Then it all made sense. "Halftime, boom, whistle blows, floor clears," says Alfonso Redic, one of Mayweather's bodyguards. "Floyd gets up and walks right over to Pacquiao. Didn't even say a word." The fighters exchanged numbers and agreed to meet later that night in Pacquiao's hotel suite. Mayweather dismissed most of his entourage. He arrived with only a videographer, a female companion and Redic, who stood outside the door. Mayweather sent Espinoza, the Showtime executive, a text around 11:30 p.m. "FaceTime me," it read. Espinoza was in Phoenix for the Super Bowl that weekend, and out at dinner. A BlackBerry devotee, he borrowed a phone and went outside to the alley behind the restaurant. The phone showed Mayweather and Pacquiao on the couch. Mayweather wanted Espinoza to assure Pacquiao and his adviser, Michael Koncz, that Showtime still wanted to make the fight. "That's probably the moment I realized this negotiation isn't like any other I've been in," Espinoza says. Koncz and Pacquiao left the suite convinced that Mayweather wanted the bout as much as they did. They told Arum that in a subsequent phone call. Mayweather felt like Pacquiao had listened to him. Of the meeting, Mayweather says, "That's the reason the fight happened." Do you know the waiter story? True story. Eight months earlier the restart of negotiations had opened with a waiter. His name is Gabriel Salvador; he works at Craig's in West Hollywood, where Moonves frequently dines, and his son trains at the Wild Card Boxing Club under Roach. Salvador mentioned to Moonves that he knew Roach and would like to set them up. Moonves agreed, and Salvador went to Roach and suggested that he call Moonves. He did, and they agreed to meet at Scarpetta, a restaurant in Beverly Hills. It was the Wednesday after Memorial Day 2014. Roach skipped breakfast and lunch in anticipation of the meal, but Moonves suggested they sit at the bar. He ordered a vodka; Roach, who doesn't drink, opted for a water. Moonves said that Mayweather's pay-per-view numbers that month in his first bout with Marcos Maidana had been underwhelming, as had those for Pacquiao's rematch against Tim Bradley, held that April. There was only one fight that anybody cared about, and he wanted tomake it. Roach told Moonves he would have to go through Arum, who had approached Pacquiao about a two-year extension back in March. But Moonves and Arum, once close friends, had fallen out after Arum took Pacquiao to Showtime, which is owned by CBS, for a bout against Mosley, only to return immediately to HBO. "Look, I'm a big boy, and I get that this is boxing and things happen," Moonves told SI in March. "We made them a zillion dollars, and then suddenly their next fight is at [HBO], and you don't feel good about it." At the restaurant he turned to Roach. "[Arum's] the f------ devil," Roach says Moonves told him. "It's kind of your fault," Roach responded. "I mean, I'm not a businessman, but you took a verbal contract?" Moonves laughed, and the meeting ended amicably. Roach called Arum and suggested that he and Moonves get together. "Tell him to go f--- himself," Roach says Arum told him. But Arum ultimately agreed to host a sit-down. Roach laughs at that story now. He never did get that dinner at Scarpetta. He stopped at McDonald's on the way home. Leslie had a couple of meetings and gauged what he thought was sincere interest. He was the catalyst. The list of people that everyone in this field likes and respects and admires is really, really short. It may be one person. Arum’s house sits high in Beverly Hills, downtown L.A. stretched out in the distance. Arum is outside, at the table in the manicured backyard. He picks at a fruit platter. "We sat right here," he says. They first met last June, shortly after Arum underwent knee surgery. Moonves lives down the street from Arum. Roach and his agent, Nick Khan of CAA, arrived 10 minutes late to give the friends turned adversaries time to hash out any differences. Arum's housekeeper fixed everybody but Roach cocktails, and Roach turned to Moonves. "How's my show doing on Showtime?" he said. "What are you referring to?" Moonves asked. "Ray Donovan," Roach responded. "Trainer in Hollywood who has Parkinson's." After that the negotiations went back and forth. The parties spent the most time on the revenue split. One scenario Arum says he proposed involved Mayweather getting 70% if he won and 50% if he lost. Roach, mostly silent, chimed in with a suggestion. "We're going to need someone to get through all of these disputes," he said. "Someone like Jimmy Carter, Nelson Mandela or Bill Clinton." "Um, Nelson Mandela is dead," someone responded. "Hang tight," Moonves told the others as they left his house. "I need to see Al and Floyd." Arum, his knee still healing, limped with the group outside. He leaned on Moonves for support, and as Roach watched them, arm in arm, he says, "I knew the fight was going to happen." Moonves initially wanted to stage Mayweather-Pacquiao in late 2014, but he ran out of time. Mayweather announced a rematch with Maidana for that September. But before that bout was announced, Moonves surfaced at a random Showtime fight. It seemed odd. But he was there to meet with Mayweather and Haymon. I don't regret anything. The timing is right. To Arum, the months that followed the June meeting felt like a stall. "I didn't think they had Floyd on board," he says. Espinoza says the sides continued to discuss the bout in August and September and that their discussions "really picked up steam" after Pacquiao beat an overmatched Chris Algieri in November. "This is for real," Moonves told the Mayweather side, according to Espinoza. "We have the opportunity to make history." "There were a couple of times I called Stephen, and I thanked him, and I said, I can't do this anymore—I've got a day job here," Moonves says. Each side was accusing the other of not wanting to make the fight, like children squabbling in the world's most expensive sandbox. They met in the same den in which Moonves and NFL commissioner Roger Goodell had hashed out a deal to put Thursday Night Football on CBS. Arum and Haymon carried notepads. One sat on the couch, another on a chair. They had last interacted in 2006, when Haymon handed Arum the check to buy Mayweather out of his Top Rank contract. In two hours Arum and Haymon reached agreement on about 20 negotiation points. Some were major, such as a 60–40 split in favor of Mayweather; others were minor, like signage at the arena. Arum says three points of contention remained after that meeting, and they were so small, he cannot remember what they were. Afterward, the nemeses shook hands. "I mean, it wasn't f------ rocket science," Arum says. All believe the delay in making the fight actually proved beneficial, that six years of will-they-won't-they, he-said-he-said built the bout into an event that will rank among the richest and most viewed in sports. In his office, Moonves is asked if he plans to broker a rematch. He laughs and says, "I don't even want to think about that." For all of SI.com's coverage of the Mayweather-Pacquiao fight, including exclusive photos, videos and more, click here.